A new mid-season variety with good compact spine free growth that is very easy to manage. 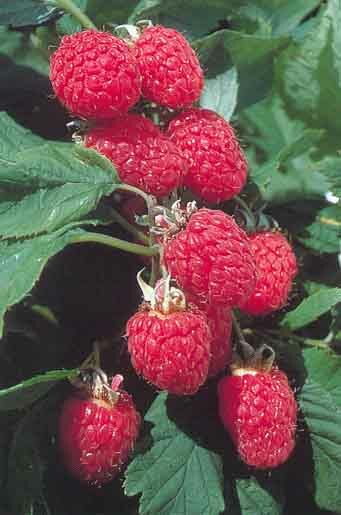 The medium sized fruits are firm with a lovely tangy flavour and have excellent keeping qualities. They will keep fresh in the fridge for several days after picking. The bright shiny red fruits are easy to pick as the new canes tend to emerge in the centre and away from the ripening fruits. The quality of the fruits is superb and yields are extremely high, similar to Glen Moy. With its compact spine free canes, Glen Lyon is a perfect garden variety but it does require good soil conditions to thrive. Do no plant this variety on poor or heavy soils. Glen Lyon will often give you the bonus of an autumn crop by producing more fruits on the tips of the new canes later in the year. Highly recommended for all good soils.